This is the address to my Face Book fan page if you are interested. Some have been asking for the address: Just click here. You may have to sign up for Face Book first if you are not already a member. I keep you abreast of upcoming events, my books and all kinds of things. I returned home late last night from the Boston Catholic Women's Conference which was truly wonderful. It was a day filled with grace! I will give you some highlights later on, but now I'd like to tell you that it will be aired on Catholic TV at noon (Eastern Standard Time) today. You'll be able to see all of the speakers (myself included) and the beautiful Mass. To find information to tune into Catholic TV from your computer or TV click here Just scroll over until you see the Boston Catholic Women's Conference and you'll also see my name which you can click on. You can see my talk here.. I am leaving for Boston to give a talk tomorrow at the Boston Catholic Women's Conference. It's a snowy blustery day here so please pray for every one's travel and all to go according to God's holy will. Thank you for your prayers. Here's a short Youtube: here. Thank you for your prayers! I'll post again when I am finished with the conference about my radio show coming up on Monday or Tuesday morning. Catholic TV will cover my talk at the Boston Catholic Women's Conference coming up this Saturday in Boston. You can check out the details here. Lisa, I am thrilled about your book for many reasons, but two come immediately to mind. One is that your book is a wonderful comprehensive handbook for Catholic mothers everywhere and the other is that the world now has access to a book written by you! You’ve been so long working to hold down the fort at Catholic Mom.Com which you have created to help Catholic and Christian families and we have all felt your warm voice through it as well as have heard it through your podcast, Catholic Moments, but now we can read your book – another creative and inspirational means to communicate with us! Would you please tell us what went behind the idea of creating this book? Thank you, Donna-Marie, for your kind welcome and especially for being a contributor to The Handbook for Catholic Moms. When my publisher, Ave Maria Press, approached me about doing a book based on the CatholicMom.com website, they gave me a great opportunity to take what we’ve done online and to create a lasting, tangible and cumulative resource for Catholic moms. 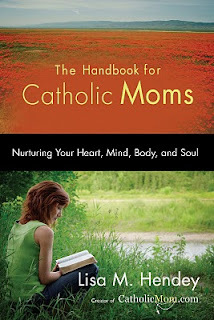 I wanted the book to capture the same sense of community and support that we have built at CatholicMom.com, with the goal of encouraging Catholic moms to care for and nurture ourselves so that we can better serve our families, our communities and the Church we love. Well, you certainly have done that for sure. Your book is a wonderful extension of Catholic Mom.Com! Your book is very all-encompassing. How long did it take you to write it? From conception to publication, the book publication process took approximately eighteen months. As a first time author, I found it fascinating to watch the process unfold – each step is critical, but for a blogger like me who is used to “immediate gratification” of writing online, the many phases of writing a book can feel very drawn out. Once my initial proposal and outline were accepted, I spent approximately four months in serious daily writing. The first draft of the manuscript was completed about nine months prior to the eventual publication. Those months after the first draft were filled with editing and subsequent drafts. I was blessed to work with the world’s best and most gifted editor, Eileen Ponder. Eileen is a fellow Catholic mom who holds an advanced degree in theology, and is an incredibly faith-filled writer in her own right. In retrospect, I see now that every step of the writing process was critical to the finished process. Have you ever tallied up the many people who have contributed to your motherhood masterpiece including the friends you include in your text as examples of the points you’re illustrating as well as endorsers and sidebar contributors? It would seem that a lot of wisdom has gone into this mother’s handbook. I think it was a brilliant idea to include many perspectives in your book to really bring it to life and make it a book that so many can relate to. I should definitely take the time to do that tally, but honestly it would take me while to do so! Countless voices contributed to this book. We have over thirty formal “sidebar” contributors – talented writers like you Donna-Marie – who shared their wonderful perspectives for each of the chapters in the book. These include moms, dads, priests, and a deacon, each of whom was specifically chosen for their unique voice and qualities. In addition to these contributors, I was blessed to have input of stories, quotes, ideas and encouragement from hundreds of my online friends in the CatholicMom.com, SQPN.com, FaithandFamilyLive.com communities, as well as in my social networking venues. It's just amazing what you have done to draw all of it together into a superb resource for Catholic moms and families. What are your hopes for your book, Lisa? My greatest hope is that The Handbook for Catholic Moms will be a support and an encouragement to Catholic moms and the families they love and serve. I hope that women will hear and embrace the book’s message. What was the most difficult part about writing this book? As I’ve shared in other places, last year I was diagnosed with DCIS, the most common form of non-invasive breast cancer. The diagnosis coincided with my writing the book, and my publisher offered to delay my deadline while I pursued my treatment. I was blessed that my situation was diagnosed early through a routine mammogram (note to women – go get your mammograms! ), so I was treated with surgery and seven weeks of daily radiation therapy. I decided to try to work through my treatments and see what would happen. With the amazing prayer support of my friends as well as the hands-on care of my family and doctors, I was able to write my way through those seven weeks and hit my stride once my radiation treatments were finished. Honestly, what could have been the greatest challenge turned into an opportunity to see such a tangible sign of God’s grace in my life. Aside from this situation, probably the most difficult part of writing the book was finding the time necessary to spend several focused hours per day in serious writing. We moms need to be time management experts to succeed in our vocation, so I put many of those strategies into place while writing the book. Lisa, I think that readers will find this really incredible to hear. I don't think you'll ever forget the writing process for this book, Lisa! God has truly blessed you and given you many graces to persevere through the challenges. I am sure that He is very pleased with you. What was the most heart-warming part about writing it? I have to say that the support and encouragement of my online friends was the most heart-warming part of this project. Every day, first thing in the morning, I would announce my writing topic for the day online. By the time I sat down in the library to write, I had a handful of quotes, stories, suggestions and prayers from my “fellow writers” all over the world. I was astounded by the generosity of spirit within so many souls I have never met in person who took on ownership of this project. That was a true blessing! That is such a blessing! Will you be going on a book tour to greet your fans? Well, unlike Mrs. Sarah Palin, I don’t have an entourage or a publisher paying for me to criss-cross the country promoting my book. I do have an amazing publicist and friend, Amanda Williams, of Ave Maria Press, who has been working with me to enable me to get out and share this book with others. I will be doing a good amount of speaking at conferences and in parishes around the country during the next several months. Readers can visit my personal website at www.LisaHendey.com to view these opportunities. Additionally, if your parish, group or organization is seeking a speaker, I would love the opportunity to come and meet you and speak to your group. In the coming months, I will be in the Chicago area, Indiana, Nevada, New York, Pennsylvania, Ohio, Boston, Colorado and of course California. Feel free to contact me at lisahendey@gmail.com to discuss these or other potential visits. Lisa, do you have plans or hopes for a future book? At this point, I am fully engaged in promoting this book and reaching out to Catholic moms and their families to provide support and encouragement. I absolutely love writing and would welcome the opportunity to take on another book project if that is what God has planned for my life! Is there something else you’d like to tell us? 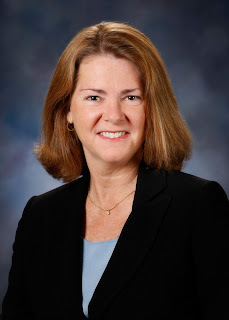 Donna-Marie, I would love to thank you for serving as one of my writing mentors, for your contribution to The Handbook for Catholic Moms, and for the work you do here and through your books to support and encourage women. You provide a beautiful role model for people like me who are looking to fully live out our faith in our own domestic churches! That's very kind of you to say, Lisa. Thank you very much. Finally, Lisa, where can we buy your book? If you are blessed enough to have a local Catholic bookstore in your community, I hope and pray that you will support them by buying The Handbook for Catholic Moms: Nurturing Your Heart, Mind, Body and Soul locally. You can find a growing list of Catholic booksellers carrying the book at here. Additionally, readers can purchase the book online at The Catholic Company, Amazon, Aquinas and More, or Barnes & Noble. Thank you very much, Lisa for the time in answering my questions and the time and love you put into your wonderful ministry to Catholic moms and their families. God bless you! To all of the readers, I recently heard Teresa Tomeo on Ave Maria Radio on Catholic Connection speaking with Lisa in an interview about this book and has suggested that The Handbook for Catholic Moms would be a great book for Lenten reading. My endorsement of Lisa's book: "Lisa Hendey is the sister friend of Catholic motherhood! We know her so well through her work for families, her website: Catholic Mom and her engaging podcasts. She now brings us her book: The Handbook for Catholic Moms; Nurturing Your Heart, Body Mind, & Soul in which Lisa openly discusses the essential elements of a Catholic Mom’s life in an exceptionally delightful, engaging, dynamic, and practical manner. You’ll be turning pages and feeling as if Lisa is there by your side lovingly offering her insight and warm encouragement. You’re going to love this book!" “…a thorn in the flesh was given to me...” (2 Corinthians 12: 7). No one really knows what caused St. Paul to struggle, but there was something that really bothered him. He pleaded with the Lord that his difficulties be taken away, but Paul received an answer that he was not looking for: “My grace is sufficient for you, for power is made perfect in weakness” (2 Corinthians 12: 9). We all take as a given that the goal of Christianity is entering into eternal life; however, attaining this goal requires intense daily effort on our part. The spiritual life is not an easy endeavor because of our wounded human nature. True, Baptism washes away original sin, but we are left with the effects of original sin. We do not have complete control over ourselves. The spiritual life is a continual battle. Because of original sin, our weakened wills and darkened intellects will always move us in the wrong direction. Continual effort is necessary to control the inner movement of our ego and allow the presence of grace to take control of our thoughts, desires, and actions. The battle of the spiritual life might be compared to walking in a river against the current. If we do not continue walking or reaching out toward a rock for support, then the current will most assuredly carry us in the opposite direction. The Catechism tells us, "Because man is a composite being, spirit and body, there already exists a certain tension in him; a certain struggle of tendencies between spirit and flesh develops. But in fact this struggle belongs to the heritage of sin. It is a consequence of sin and at the same time a confirmation of it. It is part of the daily experience of the spiritual battle” (CCC #2516). If the spiritual life is a continual struggle because of original sin, the present...(Continued here at Fr. James's blog. 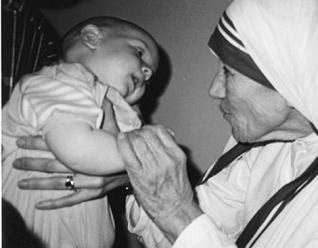 The story of an American mother’s ten-year friendship with Mother Teresa of Calcutta. February 15, 2010. There are not many women who can say that their lives and families have been illuminated by a friendship with a saint of Mother Teresa’s stature. Donna-Marie Cooper O’Boyle can. Her most recent book, Mother Teresa and Me: Ten Years of Friendship (published by Circle Press), tells the story of a friendship that unfolded in her life as an unexpected gift, bringing blessings of spiritual growth to her entire family and to the people she went on to serve in her many apostolates. It is a book well worth reading, full of personal words of advice from Blessed Mother Teresa, and sprinkled with stories of the many miracles, small and great, that flow from a life of authentic prayer and surrender to Jesus. It all began with a hug. Donna-Marie and her three small children were attending Mass at the Missionaries of Charity convent in Washington, DC. When Mother Teresa saw her six-year-old daughter Chaldea making her little genuflection before Jesus in the Eucharist, she swooped down on the child (who was about her height) to embrace her. Later, as the family stood outside the chapel, Mother Teresa appeared again and greeted the young American family. As they were chatting, the two-year old Jessica squirmed out of her mother’s arms and “made a beeline for the nun.” To Donna-Marie’s astonishment, Mother Teresa and the child held hands and simply gazed at each other for a long time. “That was when Mother Teresa told me that Jessica might become a sister of the Missionaries of Charity one day,” writes Donna-Marie. That was also the day a friendship was born. 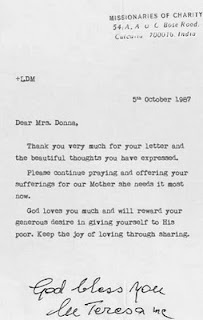 Over the years, Donna-Marie wrote letters to Calcutta, sharing personal situations, including some heavy crosses and trials. Mother Teresa always wrote back in her carefully typed letters, written on the same antique typewriter. For Donna-Marie, each of those 21 letters—[editor's note: 22 letters] and the handful of personal meetings [note from editor: over a dozen personal meetings] that followed— was a beacon of hope, an encouragement on her own path toward holiness. But beyond the letters, there was another form of communication at work: the exchange of prayers, and the sense of communion in the mission to live the Gospel. Not surprisingly, Donna-Marie’s own spirituality was deeply influenced by Mother Teresa’s example. Before too long, an apostolate of writing and speaking was born alongside the works of mercy that she had long practiced with her family. Mother Teresa and Me does just that. In a world that yearns for heroes, for true saints who live the Gospel authentically and honestly, it is deeply encouraging to read the story of this friendship and of the many miracles and graces that have flowed from it. Mother Teresa and Me is an inspiring push toward that goal of holiness, a reminder that God has big plans for us… if we let ourselves be led by him. 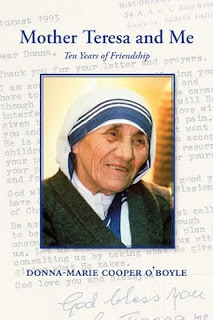 Guess who the winner is of the Mother Teresa and Me: Ten Years of Friendship book give away? "Hi Donna Marie! I'd very much like to be entered into the contest, so that I may have an opportunity to read your newest book. I've had to cut back on my book buying over the past year or so and sadly, my local library doesn't carry many books such as yours. I'd like to learn more about Mother Theresa. Before converting to Catholicism, my only real exposure to it was my granny (a catholic who married a man who it turns out is very Anti-catholic), my aunts on my father's side, and what I saw on TV of Pope John Paul the II and Mother Theresa. Something about her radiated, as did our beloved Papa...I don't get as much time to learn about our faith as I did after my conversion, as most of my time is spent caring for two little ones, but I long to learn more. The winner of this contest was picked in a random drawing not because of the content of their entry. I will be contacting Jamie by email and ship off an autographed copy of my book ASAP! Stay tuned for another contest for one of my books perhaps right after Easter. Through that humble girl, Mary revitalized and continues to revitalize the faith of millions of people. People began to flock to Lourdes from other parts of France and from all over the world. In 1862 Church authorities confirmed the authenticity of the apparitions and authorized the cult of Our Lady of Lourdes for the diocese. The Feast of Our Lady of Lourdes became worldwide in 1907." Take a look at this short but very informative You Tube about the Boston conferences coming up. You can see the the recent interview with Al Kresta and me here. Some things are meant to be shared. 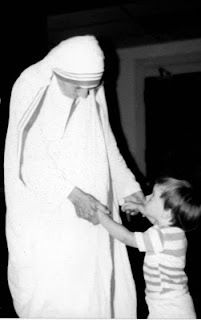 Friendship with Blessed Mother Teresa of Calcutta is one of those things. I personally know three people who were friends with Mother Teresa and like a second-class relic, those second-class friendships leave me feeling somehow closer to her. Donna-Marie Cooper O’Boyle is one of those friends who was blessed to have known the little nun that captivated the world. Through Donna-Marie, I have often felt Mother Teresa’s long shadow. Their decade-long friendship began by a chance encounter that was surely arranged by God. It led to an on-going correspondence and meetings. Although Donna-Marie is humble and private by nature, she came to feel that the spiritual mentoring she received from Mother Teresa was meant to be shared. Mother Teresa had constantly encouraged her to keep writing and even wrote a Forward for one of her books and back cover endorsements on others. It only made sense that their own friendship would one day be recorded in a book. Mother Teresa and Me (CirclePress.org ) brings us into the fold of a friendship with Mother Teresa. Through Donna-Marie, we feel this holy nun speaking to us too. "After observing the sisters care for the dying with smiles, tenderness, and compassion, I began to understand why the patients seemed so at peace despite their suffering: They were immersed in genuinely selfless love. "Later I would learn that Mother Teresa and the sisters taught the patients about redemptive suffering, encouraging them not to ‘waste’ their pain, explaining that God could sanctify it if they offered it to him through prayer. We felt honored when the sisters invited us to return the next day for Mass in their chapel. When they told us Mother Teresa would be at one of the Masses, we were awestruck." The article continues at Catholic Exchange here. You can listen to my interview with Al Kresta by going here and then looking in the left column to find the date of Feb. 2nd and the second hour. Click on that and then drag the little playing arrow to the right almost 3/4 of the way to the right. The timer will say "39 minutes." I hope you enjoy our little chat. God bless your day! A new women's study group has formed! "Sacred Heart Parish, Riverton NJ has now formed a young Women's Faith Sharing group! The Women's evening Bible study kicked off their gathering with a 'Soup and Scripture' night. The women will gather monthly using The Domestic Church:Room by Room: A Study Guide for Mothers written by Donna-Marie O'Boyle. Through this study guide, Donna-Marie will lead the women into a deeper relationship with Jesus through the assistance of Our Blessed Mother." I hope you can join Al Kresta and me tomorrow (Tuesday) at 5:30 PM to 6:00 PM Eastern time. We will be chatting LIVE on Ave Maria Radio aired through EWTN and all of its affiliates and through Sirius Radio. We will be chatting about my book: Mother Teresa and Me: Ten years of Friendship and of course, my friendship with Blessed Mother Teresa. I am honored to be Al's guest again. He has a great inspirational show every afternoon called "Kresta in the Afternoon" where he "talks about things that matter most." I have thoroughly enjoyed listening to Al's show and also being a guest on Al's show both in person LIVE at events I have attended around the country and over the phone LIVE as well.